Budget carrier SpiceJet on Saturday announced it would begin operations from Punjab's Adampur from May 1. 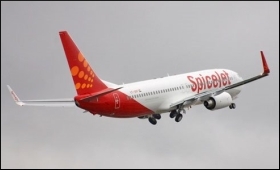 "SpiceJet was awarded Adampur under the first round of UDAN (the Central government's regional connectivity scheme)," the airline said in a statement. The airline has announced a limited period "special introductory all-inclusive one-way fare" of Rs 2,062 for Delhi to Adampur and Rs 1,953 for Adampur to Delhi with immediate effect, it said, adding that the offer is applicable on a first-come-first-serve basis. SpiceJet would deploy Bombardier Q400 aircraft on the route, with SG 8731 to take off from Delhi at 3.30 p.m. and reach Adampur at 4.45 pm, it said. The return flight, SG 8732, would take off from Adampur at 5.05 p.m. and reach Delhi at 6.15 p.m. The airline had launched services on the Mumbai-Porbandar, Mumbai-Kandla, Jaipur-Jaisalmer and Hyderabad-Puducherry routes under the UDAN scheme last year. SpiceJet also recently announced the Hubli-Chennai and Hubli-Hyderabad UDAN routes which would be in operation from 14 May.